The Return man is a post-apocalyptic Zombie novel that manages to offer a few surprises and original ideas in this rapidly expanded sub-genre. The story goes that a mass "outbreak" divides America in two, on the east the untouched survivors remain safe while the west has become truly wild - a ravaged wilderness populated by the walking dead (or "resurrected" as they are known here). Our hero of the novel Henry Marco (who was once a Doctor) remains within the "evacuated states" and makes a living by tracking down the dead on behalf of grieving relatives and delivering them a final, permanent peace. The reconstituted US government wants to use Marco's unique talents and asks him to return to the birthplace of the apocalypse and locate an ex-colleague who is though to be keeping a secret about the "resurrection", a place where his own tragic past waits to punish him again. The Zombies in The Return Man are the modern George R Romeo inspired, rotting, flesh-eating types which require some serious damage to the head / brain in order to kill. There are a number of things that make this novel different though. Firstly the book deals with the effect that Zombiefication would have on surviving loved ones / family members and this is where Marco comes in, hunting down a particular person on behalf of a survivor and putting their animated remains at peace. Secondly the actual outbreak is much more contained than most novels depict, not only is a large part of the US safe but it's also hinted that other parts of the world are too. The infection isn't quite as contagious as many novels either, it's not airborne (or at least not at this stage in its history) and you need more than a little graze to get infected. This provides a bit more resilience to the people fighting this horde and means that unless they get bitten or have a serious wound they are unlikely to be turned. There is a very plausible argument given as to what the Zombie disease actually is and what it does too, although we don't get into the amount of detail that affects the pace or cannot be understood by the non medical. The story is tremendous, totally gripping and orchestrated in such a way to keep the reader on their toes, with plenty of twists, turns and dramatic moments - this is one of those page turners that grip you completely. The prose is easy to read and very clever while characterisation is spot-on. There is a considerable amount of action which includes descriptive and graphic violence (this is after all a Zombie novel) but this never becomes gratuitous and there are some superbly choreographed fight scenes. The character of Henry Marco is played out brilliantly, given an incredible depth and heart-tugging back story that pretty much explains his reasons for doing what he does. Despite shooting animated dead bodies in the head for a living, he's actually a pretty nice guy and very easy to relate to. The journey that he takes through this altered landscape becomes at times somewhat reflective and the author does an effective job of highlighting the differences between pre and post resurrection. 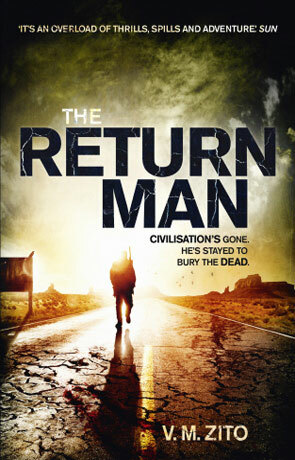 The Return Man is a must for any fan of the genre, along with anyone else who isn't squeamish. Written on 13th April 2012 by Ant.